Ok dolls, we've got just a few weeks to go before the wedding of our friends Janine and Vikrum. We were wondering about wedding traditions and figured who better to tell us about an Indian Wedding than someone who's been to many is now planning one herself. Here's a post from our good friend, Tina Duggal, who was kind enough to give us the 411 on Indian weddings. As Tina is getting married this summer, she is definitely an expert on wedding planning. We hope to share images from her big day, but for now read on for Indian Wedding 101. An Indian wedding can be (and usually is) a lavish, multi-day affair. From the bright colors, to the singing and dancing, to the beautiful traditional outfits, it's definitely a must-attend for anyone who is obsessed with weddings. Hindu wedding traditions can span up to nine days, so each culture and even each family can modify it to suit their needs. However, the main ceremonies include the sangeet, the shaadi, and the reception. For the days prior to the first event (the sangeet), many smaller events occur in both the bride's and groom's homes, respectively. There are various poojas that need to be done in order to provide the most auspicious environment for the family and the home. The homes are adorned with lights and decorations (almost like Christmas has come early! ), and there is usually lots of singing and dancing as well. The wedding is an extremely joyous time, not only for the bride and groom involved, but for their respective families. In Indian culture, it is said that you are marrying into your partner's family, and so the families meeting, getting along, and enjoying each other's company is very important. 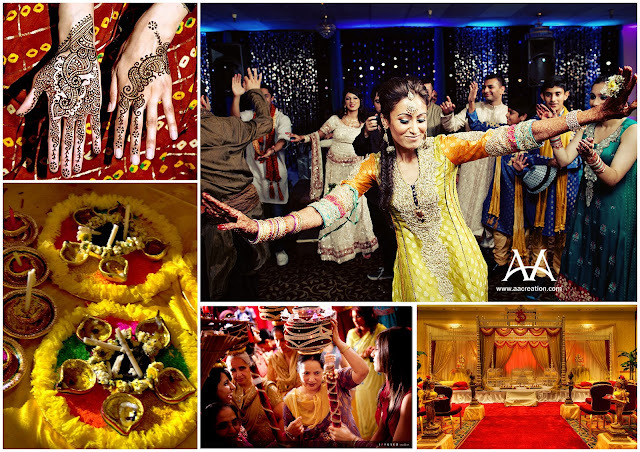 The sangeet day is a formal event of singing and dancing. Some people host this event within their homes, while others can rent out a banquet facility or the like. Traditionally, this was one of the 'separate events' that occurred in both the bride's and groom's homes, but nowadays, it is a joint event hosted by both families. It is basically a pre-wedding celebration where everyone gets together to celebrate the upcoming nuptials of the brides and groom. It also used to be the day that the bride had henna (or 'mehndi' in Hindi) applied to her hands and feet. The bridal henna is very intricate and beautiful, and can take 3-4 hours total to apply! It has no religious significance, as it is also applied to brides in Pakistan and Afghanistan (where Islam is the predominant faith), but is a way to decorate and adorn the bride for her wedding day. Check back next week for our continuation and more on Indian Weddings!